Skoda wants to carry over the hybrid system in its Vision X concept (shown) to the production version of the car. MLADA BOLESLAV, Czech Republic -- Skoda says it has “ambitious sales targets” for its new small SUV, which will be the third crossover added to the automaker’s lineup in three years when it arrives next summer. The new model will be based on the Vision X concept unveiled at this month’s Geneva auto show. The production version will debut at the 2019 Geneva show, Alain Favey, Skoda’s head of sales and marketing, told journalists at the Volkswagen Group subsidiary’s recent financial results press conference here. Favey wouldn’t give sales targets but said the new model would become Skoda’s No. 2-selling SUV after the compact-sized Karoq, which was launched late last year. Skoda's SUV family also includes the Kodiaq midsize SUV. The small SUV will account for much of the planned 80,000 capacity increase at Skoda’s plant here, Favey said, without being more specific. The new addition will give Skoda a true competitor in Europe’s small SUV sector, which grew 6.4 percent to 1.34 million sales last year, according to data from market analyst JATO Dynamics. Skoda’s entry will be VW Group’s third launch in the segment, joining the Seat Arona and VW T-Cross, which arrives later this year. All three will use VW Group’s MQB A0 platform. 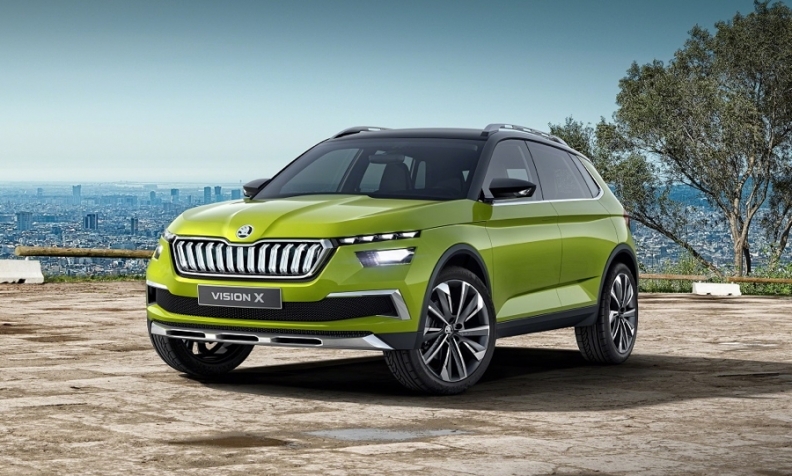 Skoda is pushing to include the hybrid technology previewed in the Vision X concept in the production model, Skoda CEO Bernhard Maier said at the results conference. “We are definitely fighting for it. We are in discussions with our colleagues in the VW Group because we want to gain all the synergies that are part of this project,” he said. The Skoda-developed hybrid technology uses a lithium ion battery mated to a rear-mounted electric motor to power the rear axle, giving four-wheel drive with no link to the combustion engine up front. The battery is recharged during braking and when the car is rolling so there is no need for an external plug, Skoda said. The Vision X concept, which can be driven, uses a 1.5-liter turbocharged engine powered by either compressed natural gas (CNG) or gasoline with a belt-driven starter generator 48-volt mild-hybrid system in addition to the electric rear axle. Skoda claimed the car can achieve CO2 emissions of 89 grams per kilometer but be sporty enough to accelerate from 0 to 100 kph (62 mph) in 9.3 seconds. Maier said the concept gave a good idea of the production car’s design. The look of the car from the front updates Skoda’s styling for its SUV range with a more modern treatment of the lights. Slim light units mounted higher up incorporate the daytime running lights and indicators, while larger units below contain lights for use at night. Inside the car includes a large so-called “floating” infotainment screen, marking the first time Skoda has elevated the screen like this. Skoda said the concept’s interior points to a “fundamental” change to the cabin design of its production cars. The Vision X measured 4255mm long, 1807mm wide and 1537mm tall, making it longer and wider but slightly lower than Europe’s top-selling small SUV, the Renault Captur. The Vision X is also slightly longer than the Skoda Yeti, which it largely replaces in this segment. Skoda sold almost 60,000 units of the Yeti in Europe in 2016, which was the car’s final full year of sales.